See an opportunity. Seize the opportunity. Do it now, while the story is still hot. Long-term campaign planning is fine and well, but if that's where you put all your focus, you will miss powerful opportunities to draft off of what's going on right now. This is according to David Meerman Scott, author of the Wall Street Journal best-selling book, "Real-Time Marketing & PR: How to Instantly Engage Your Market, Connect with Customers, and Create Products that Grow Your Business Now." 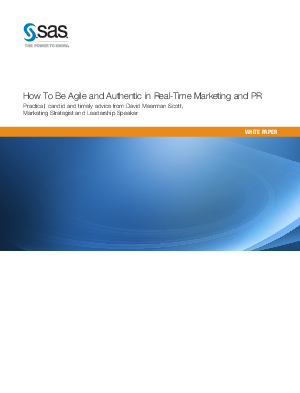 This white paper includes practical, candid and irreverent advice from Scott on what it really means to be real time in marketing and PR.